Searching for that perfect ring? Read this first. In the past few decades, more and more couples are starting to go for custom engagement rings. Instead of going the traditional route of finding their engagement ring in the jewelry store, or even online, having a custom ring created by a professional jewelry designer is becoming more and more common. Why? There are plenty of reasons for this gradual shift in interest, but one of the major reasons is that a custom engagement ring is often more affordable and higher in quality at the same time. Intrigued? Read on to discover 10 detailed reasons why a custom engagement ring is actually a better choice for most couples. Although a wedding ring you pick up at that chain jewelry store might look good, it definitely doesn’t have that personal touch. When you work with a private jewelry studio, you actually have an opportunity to create something that’s totally unique for your partner. It’s much more thoughtful to dream up an idea or choose a special design just for her. She’ll appreciate the extra effort that went into it, and given that the ring is made to match her personality and taste, she’ll also connect with ring on a deeper emotional level. Although it might seem counter intuitive, having your ring made by a private jeweler can actually save you a lot of money. There’s a few different reasons for this. First, a jeweler who has years of experience in the industry can often get you better prices for your diamond or other gem. Using industry software like Rapaport, jewelers can often find diamonds at a large discount, which you wouldn’t be able to find by browsing stores on your own. Aside from this, jewelry studios don’t have the same overhead, rent, and advertising costs that big retail stores are dealing with. Stores also need to hire and train jewelry salespeople to make a sale. In the end, all of these costs, and their desire to make a large profit, add up to a very expensive ring for the customer. Although you might be able to find your custom ring a little cheaper from an online chain, the markup on the final price is still high. The great thing about working with a custom jewelry studio is that you’re cutting out the middleman and eliminating all these costs. If you have your ring made by a custom jewelry studio, you’ll likely save around 20-30%; given the large price tag of an engagement ring, this means you’re saving serious money. Of course, not every jewelry studio or brand will pass the savings along to you. Since you are choosing a unique, custom design, certain jewelers can take advantage of this and may charge you a similar amount to the retail price. In the same way, if you’re having your custom ring made by a retail store, you’ll likely pay a lot of money. However, if you find a private studio that passes along the savings to the consumer, you can expect to save $1000 or more on the final price. For more info on how to save money on your engagement ring, see our page here. On a related note, choosing a custom engagement ring actually allows you to get a better quality ring for your budget. Because you’re typically saving 20-30%, you can use these savings to make upgrades to your ring design or gemstone. For example, you can up the carat weight and get a larger diamond than you originally intended. Or, you can spend a little more on adding fancy filigree detail to the ring, or giving the ring a trendy, naturalist look. You can also use the extra funds to upgrade the ring after your proposal. Let’s face it; shopping for a ring at a big chain is a little impersonal. It can be confusing to browse through 100’s of different rings and have to make a final decision in this kind of corporate environment. You also have to deal with pushy salespeople. Unfortunately, most of the salespeople or employees who work at the retail stores have never actually been on a jewelry bench, and don’t really know the answers to many of your questions! If you shop for your engagement ring online instead, this is far from an ideal situation as well. It’s clear that shopping for an expensive ring on an e-commerce store is a little risky; after all, the ring you receive in the mail might not look quite like the one you saw online (the images online are usually 3D renders, not the actual ring). Besides, unless you’re very familiar with jewelry, it’s hard to choose your ring on your own without the help of a professional. 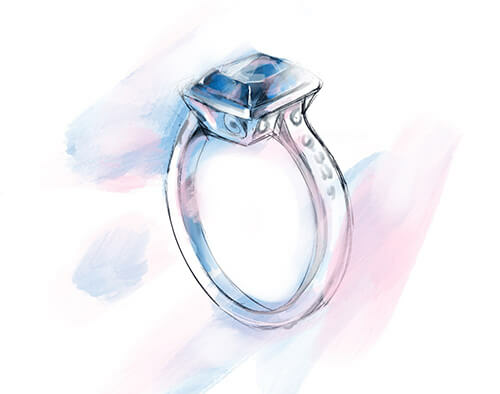 Meeting with a private jeweler is by far the best way to find the perfect engagement ring. You’ll have plenty of opportunities to discuss your aspirations for your ring one-on-one in person or via Skype, and they’ll walk you through the entire process, from start to finish. While this kind of personalized care and attention is rare in a retail store, the right jewelry studio will make sure you’re satisfied with the process and the final creation. 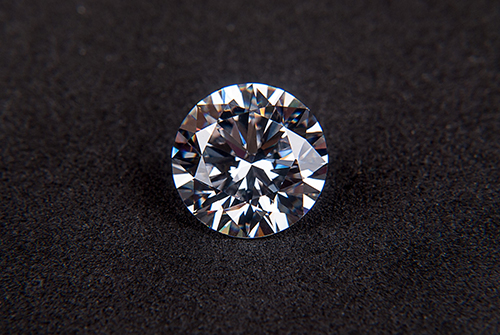 Professional jewelers have access to industry connections and privileged information which allow them to find the highest quality diamonds and gems, often for a great price. If you’re not satisfied with the diamonds rings you’re seeing, a custom jeweler can help you find the right choice. This includes ethically sourced diamonds, as well as lab-grown diamonds, which are a better choice in terms of sustainability. And always remember to work with a jewelry company that provides a GIA certificate for their diamonds to verify its authenticity and quality. If you’ve ever walked through a jewelry store, you’ll notice that most of the jewelry has the same colors with little variation. If crystal clear diamonds and white gold isn’t your taste, you wouldn’t have many options to choose from. If you want a black diamond engagement ring, or a ring crafted with green gold, it’s best to consult with a custom jeweler. They’ll help you find whatever you’re looking for to craft her perfect ring. When people think of custom engagement rings, they usually imagine their ring is going to take months to plan, design and create. In reality, it typically takes only 2-3 weeks to create most custom pieces. 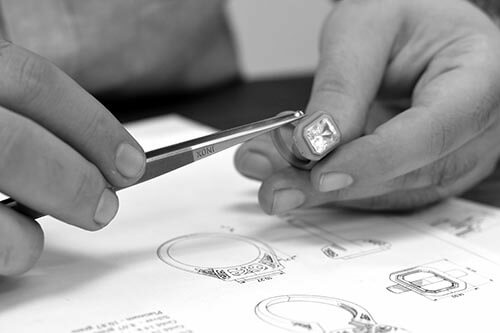 If your ring is extremely complex and requires many revisions, it may take a bit longer, but the usual turnaround time is often surprisingly fast. 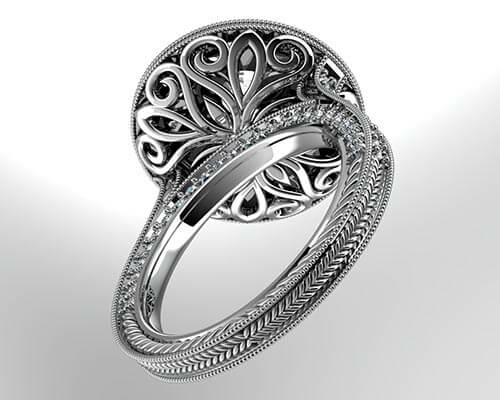 The majority of time involved in custom ring creation is the digital design. 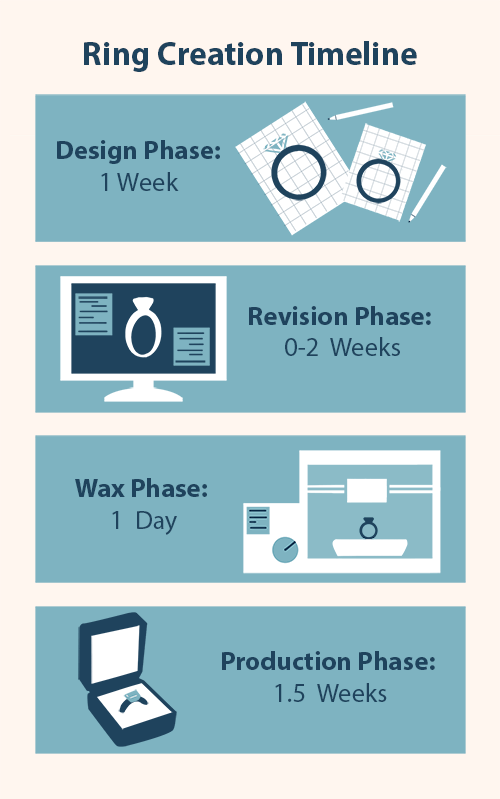 Once the design is approved, the wax can be printed within one day, and crafting the ring can be done in as little as 2-3 days. If you’re looking for a simple solitaire engagement ring, the design can be finished quickly, but if you want a triple stone, multi-banded ring with embellishments, it could take a little more time. Since your ring will only go into the production phase with your approval, your designer will be sure to make any revisions you want, so this will likely add a few more days onto the timeframe. Really, it all depends on your unique design. If you’re interested in seeing how long your engagement ring might take to make, send us a message with your idea and we’ll give you a free estimate! This is a big one. When you go the custom route, the possibilities are literally endless for what kind of ring you can make. You can incorporate designs of her favorite animal or hobby into the shank of the ring, or maybe just a naturalist carving with leaves and branches. If desired, you can even have a ring crafted that’s reminiscent of her favorite book, movie or game. Here are some super unique rings to get you thinking. If you don’t want to create one of these totally unique pieces, you can always craft a more traditional wedding ring that has a subtle twist to it. For instance, if you really want aquamarine accents on your engagement ring, or a special type of setting, ask your local custom jeweler to incorporate that into your design. Some couples hesitate to work with a designer because they’re afraid they’re not creative enough or will make the wrong decision during the process. Some also get intimidated by the unlimited options that are available for their ring creation. However, there’s really nothing to worry about, as you can have a little or as much input into the creative process as you want. If you want the designer to work with your idea and just make something nice without a long discussion, that’s perfectly OK. Alternatively, if you want to approve the design at every step and give detailed suggestions for changes, that’s fine too! Although sitting down in a jewelry studio with a designer might not seem like your idea of a romantic date, it’s actually one of the most comfortable and pleasant options when it comes to engagement ring shopping. If you’ve decided to shop for the ring together as a couple, paying a visit to the design studio might be a good idea. After all, engagement ring shopping should be exciting, and fun. Nothing kills the romantic excitement more than sitting in front of a computer screen for hours, scrolling through digital photos of your future ring, or tediously trying to figure out the complex ring-building platforms online. Similarly, visiting a jewelry store can be equally uncomfortable. It’s no fun to consider such a major purchase with your loved one while salespeople try to convince you to get that bigger and better ring. Out of these 3 options, making an appointment with your local jewelry design studio is by far the best choice. You’ll sit down with a friendly jeweler and have an in-depth discussion about your hopes and plans for your dream ring, and they’ll make sure all your concerns are addressed. The best part is, you won’t feel rushed or stressed, and it will make your engagement ring shopping a more relaxed, enjoyable experience. Part of the reason why getting a custom ring is much less stressful is because you have someone looking out for you throughout the entire process. The truth is, buying an engagement ring on your own without any guidance is hard. If you don’t know the industry inside and out, it can be difficult to find the diamond that you’re looking for at the right price and with the right certifications. In your search, you might find it hard to get the right information to make informed decisions on your purchase. And, potentially you might deal with salespeople or diamond sellers who are more interested in making money than getting you the perfect ring. At a jewelry design studio, your personal designer will look out for your concerns and make sure all of your questions are answered. They’ll also guide you through the process to help you understand your best options when it comes to designing your ring. Using the latest 3d design technology, they can accurately predict the weight and cost of your ring, so you can alter as you see fit. And best of all, they’ll use their expert knowledge to find your ideal gemstone. You’ll be able to see all the associated costs for your ring in an itemized list broken down on your invoice, so you’re sure exactly what you’re spending money on. All of this is done to make sure the customer has an easier time navigating the complicated world of jewelry, and also to improve communication, trust and satisfaction on behalf of both parties. Let’s say you choose a custom ring, but don’t take your partner along with you. Although she’ll probably love the final piece, there’s always a chance she might have expected something different. If that’s the case, you’re in good hands if you built the ring with a private jeweler. 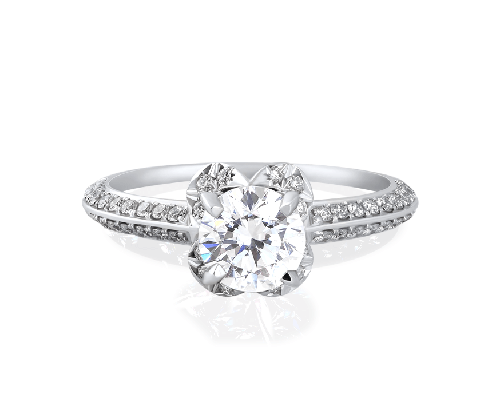 Since they crafted your ring and know exactly how it’s designed, they can easily make adjustments to upgrade the ring. For instance, if you choose a stone like an amethyst, but she really wanted a traditional diamond ring, you can work with your trusted jeweler to find a new stone and replace it. On the other hand, if she loves the stone but the body of the ring isn’t really her taste, then you can bring her into the studio to develop a new design. Since you have this safety to adjust the ring, this takes a little stress out of the proposal. If she needs her ring resized as well, that’s certainly doable and you can always bring it back to the studio to change the size. With all of these benefits, it’s no wonder why more and more people are considering choosing a custom engagement ring. For some people who just want to purchase an engagement ring quickly and don’t mind a less than stellar ring, shopping online or heading to your local big jewelry chain makes sense. But for those who want something unique and affordable, handcrafted with the highest quality gems and metal, a custom engagement ring is usually the best choice.